Are you one of the people who struggles with laundry? If so, take heart. You are about to learn how you can start to get it all under control. There are two parts to doing the laundry: collecting dirty laundry and dealing with clean laundry. This week’s habit deals with the first part of the process. When I was a young girl, in a family with 10 girls, my mom made sure we all learned how to do laundry. I believe her purpose was twofold: 1) free labor and 2) to increase our marriage prospects. (She was adamant about not having a bunch of old maids living at home during her sunset years.) Everyone would throw their clothes in one of two hampers and on laundry day, the dedicated laundry mistress would separate the clothes into piles by color and fabric weight. We averaged six to eight loads every other day. We had four clotheslines out back so after they were washed in the washing machine, they would be hung out to dry. Put a laundry hamper in each bedroom closet. Once the clothes amounted to a load, I washed it. With two kids in each room, this was about once a week. Stopped buying white clothes for the kids’ everyday wear. That way, I did not have to sort clothes any more. Everything goes in together, in the same temperature water, and the same setting on the washer. Set up a 3 slot sorter in the laundry room for 1) linens (towels, dish clothes, sheets, etc. ), 2) whites, and 3) darks. My clothes and my husband’s go there, as well as any white clothing the kids might wear for more formal events. Not having to sort by color or by person was a huge time saver. I ended up being able to wash about one load a day. I would throw it in the washer in the morning, then toss it in the dryer at some point later in the day. Dealing with one load a day made it much more manageable–especially when the kids got old enough to deal with their own incoming laundry. 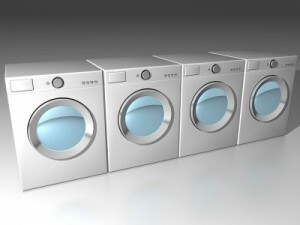 I recommend you look at your system for dealing with dirty clothes and make it convenient for you. What are your problem areas? Do others leave their clothes lying around? Maybe you need to put hampers in a more convenient spot. Have a lot of clothing that needs special treatment? Stop buying that type of clothing or set aside one day a week to deal with those types of garments. I know some of you may be very particular about your clothing and I respect that. This type of laundry system would probably not work for you. But think through the specific points in the process giving you trouble and see if you can change something to make your life easier. Tell me about your problem areas and let’s brainstorm in the comments section. I don’t really like laundry, either. I think that’s why I changed so much to minimize it–like my shopping habits! No whites and nothing that needs ironing.